Summary Atom D510 powered quad-drive, dual Ethernet NAS with ultra-flexible backup options. 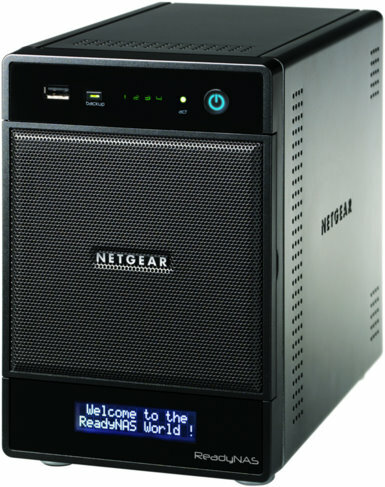 The ReadyNAS Pro 4 is NETGEAR's current top-of-line four-drive NAS. Like other members of the "Pro" family (the recently-reviewed Pro 2, for example), the Pro 4 is powered by a dual-core Intel Atom with 1 GB of RAM. Unfortunately, the Pro 2 is the only Pro family member with anything faster than USB 2.0 ports for fast attached backup. The Pro 4 has three USB ports, but they are all 2.0. The Pro 4, however, does have dual Gigabit Ethernet ports that support failover and aggregation and can also be used to connect to two different networks. Hardware-wise, the Pro 4 is essentially the same as the Ultra 4, which, in turn is similar to the NVX. The Ultra 4 and Pro 4 have more in common, however, and appear to use the same board, except for the loading of a 1.66 GHz Intel D510 Atom in the Pro 4, vs. a single-core D410 in the Ultra 4. Curiously, the Pro 2 has a more powerful dual-core 1.8 GHz dual-core Atom. Since the Pro 4 requires complete disassembly to get to the board, I took a pass. The view through the slots in the Ultra 4's empty drive bay shown below is the same as the Pro 4's. Components that I could see were an Intel 82801IB (ICH9) I/O Controller, Samsung K9F1G08U0C 1 GB flash, two Marvell 88E8057 Yukon Ultra II Gigabit Ethernet controllers and Silicon Motion SM321 flash controller. The 1 GB of memory comes on an SoDIMM, which you can replace / upgrade without voiding warranty, but at your own risk. You access the RAM on top of the Pro 4 by removing two side and one top covers. The RNDP4410 Pro 4 version sent for review had four enterprise-class Seagate Constellation ES 1 TB (ST31000524NS) drives loaded, which resulted in a 45 W power draw with the drives spun up and 23 W with them spun down. During initial boot and for some time after the fan was very noisy. But after 15 minutes or so and a recalibration request, it settled down to what I'd rate a medium noise level. The Pro 4 ran RAIDiator 4.2.16 firmware, so shares the changes noted in the Pro 2 review. To save you a click, these include support for 3 TB drives, RAID volume expansion when using "Flex-RAID" (that's ReadyNAS-ese for standard RAID), IPv6 support (CIFS and FTP only) and a new Add-ons menu. And to save you another click, I've included the same datasheet spec page below.